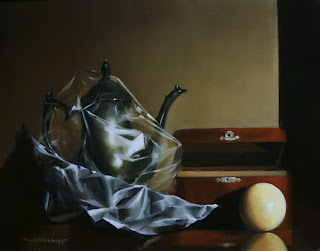 This is a tarnished antique silver coffee pot, a wooden box, and a croquet ball, with a scrap of aluminum foil and plastic wrap. This was a painting that I wanted to do to test and stretch myself a bit. Tarnished metal, foil, completely round objects, and smooth wood have, at least for me, an element of difficulty beyond the norm and I wanted to try them together in one painting. Very challenging, and very fun to paint. I hope that you enjoy it!